“VR2Planets” is a start-up with its roots in research that was created on 3rd October 2016 by François Civet. It specialises in image processing and visualising scientific data for use in geoscience and education. It was born out of a willingness on the part of the personnel working at the Nantes Planetology and Geodynamics laboratory (LPG-Nantes) to share their expertise and their passion for the planets and the universe. The staff at VR2Planets use innovative digital and virtual reality equipment in order to develop bespoke applications for visualising planetological data (among other uses) for the scientific community, academia and companies. VR2Mars is designed to offer a unique, immersive experience on the red planet. You will be able to fly over areas of geological interest on Mars, recreated in an entertaining video environment using real satellite images and to carry out your own exploration in order to discover the Mars rovers and to observe the planet’s glaciers, craters, volcanos or polar caps. 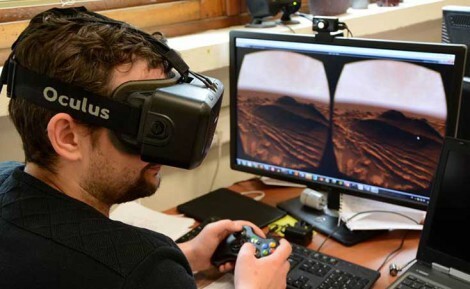 The VR2Mars application operates using 3D projection (a 3D screen and a 3D projector), on HTC Vive and Oculus Rift virtual reality headsets as well as in a CAVE environment. 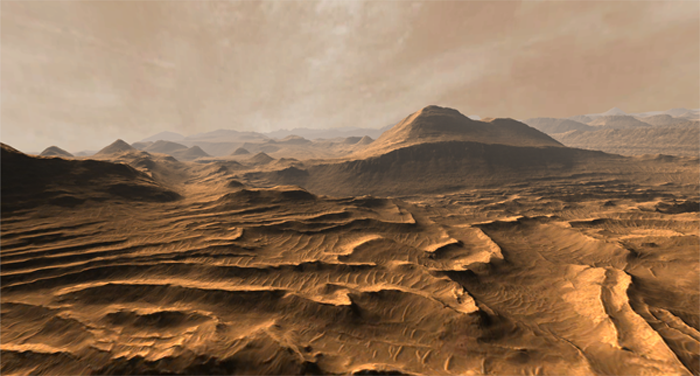 VR2Planets are available for any exhibitions or events you may be hosting linked to digital technology, virtual reality or astronomy, with VR2Mars able to create a unique, immersive experience of the red planet. The ease of movement and interaction offered by VR2Mars for their tours of Mars, coupled to a high-quality, immersive experience, results in a vision of a world that, too often, proves inaccessible. Scientists - enhance your research! Enjoy the benefits of an innovative visualisation tool that offers a unique perspective and allows you to precisely study objects or areas of interest in 3D. Academics - let’s make learning easier! Introduce your students to Mars in all its glory, with an immersive experience that is sure to pique their interest, to encourage curiosity and to stimulate a thirst for knowledge. For those of you with an amateur interest in planetology, VR2Mars lets you discover our closest neighbour in the solar system like never before. Work to develop VR2Mars continues apace, with the aim being to provide ever more scientific information and new lands to explore. > Actu : News: The "Europlanet" 2016 prize was awarded to Stéphane Le Mouélic, Research Engineer at the Nantes Planetology and Geodynamics Laboratory (CNRS / The University of Nantes) and François Civet, director of the start-up VR2Planets, for their work in developing new and immersive methods for using and visualising planetary imaging data thanks to innovative technology. They were awarded the prize on 20th October at the international DPS-EPSC 2016 meeting in Pasadena in California.